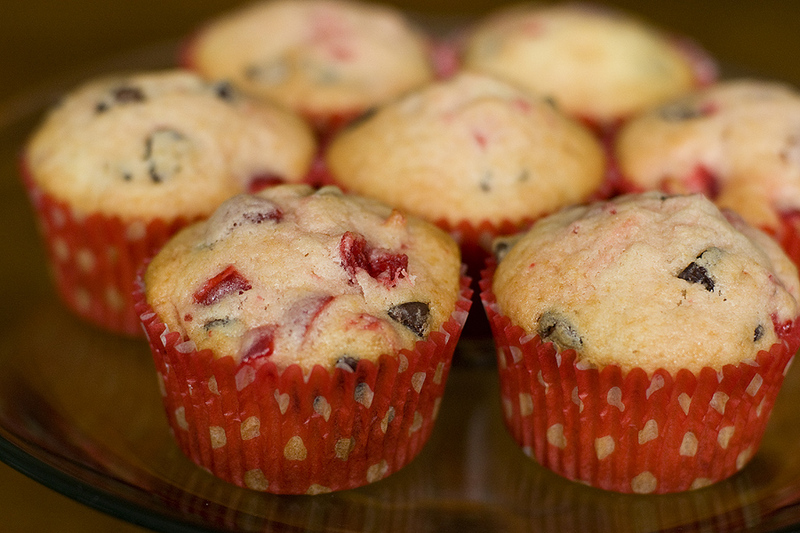 I forgot which comedian said this, but it’s always made me laugh: A muffin is just a cupcake that we’ve for some reason decided is OK to eat in the morning. So true, right?! I love cherries – maraschino cherries, bing cherries, Cherry Garcia ice cream, Shirley Temples, etc. I dug this recipe out of my to-bake folder and decided to try it. It’s a nice recipe because it only makes about 6-8 muffins — and as usual, they are best on the day they’re made. Enjoy! 2. In a small bowl, combine the flour, sugar, baking powder, and salt. In another bowl, whisk the egg, milk, oil, and extract. Stir into dry ingredients just until moistened. Fold in cherries and chocolate chips. 3. Fill paper-lined muffin cups 3/4 full. Bake for 20-25 minutes or until a tester comes out clean. Cool for 5 minutes before removing from pan to a wire rack. Serve warm.